You know I am a candle obsessed! Even before getting married or having kids I have always loved burning candles around my home. Not only do I enjoy the fragrances but I love the ambiance of a room lit up by only candle light. So when The Candle Shop first sent me a message asking me to review one of their Soy candles I was pumped! 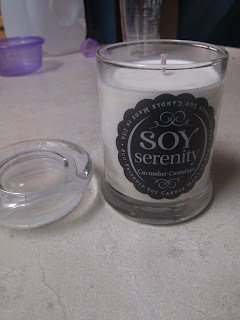 I received a small soy jar candle to a review in the Cucumber Melon scent. Unfortunately I was unable to to Amy to try out because it was a cucumber scent and she has a terrible life threatening allergy to cucumbers! I couldn't even burn it in my home when Amy was over even though we both enjoy having candles in the house. We both have cats and are constantly burning candles near the litter box to cover up any smell that might linger around after cleaning them. What we liked about this candle was that it is an all natural product and also that it is made in the USA, which now a days is a rarity to find. I (Randi) thought the Cucumber Cantaloupe Small Jar Candle smelled really fresh and nice when it arrived right out of the box. Once it was lit, it burned for about 10-12 hours straight and continued to give off a nice fresh scent the entire time. I had to tell Amy, "it's a good thing she wasn't here when I was burning it, because it really made the house smell of cucumber." Recommendation: Knowing it is an all natural candle made me love this even more than the smell which filled my home! My only complaint is that it did not burn anywhere near as long as it said it would. My guess is maybe it would burn for that length of time if it wasn't lit nonstop and was only done in a couple hour segments. The cost is pretty reasonably around what you would pay for a candle anywhere else!